We are a family-owned and operated automotive repair facility in North Phoenix, off Cave Creek Road, just south of Greenway Road, not far from the SR51 (Squaw Peak) freeway. We have a Google map of our location for your convenience. 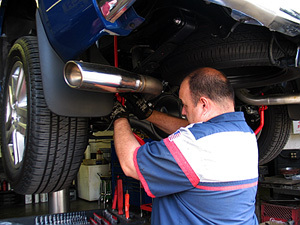 We’ve been providing quality automotive service to the Valley for over 45 years, in both Central and North Phoenix. You can read about our shop’s history here. The main reason we have been able to serve you for so long is because when we solve any automotive problem, we do it thoroughly and completely, as if it were our own vehicle being repaired. From air-conditioning against the hot Arizona sun to even the most serious of transmission problems, our ASE-certified technicians are experts in both foreign and domestic vehicles and are here to get the job done right, the first time. So whether the vehicle is your brand new Audi A4, or your beloved 1961 Volkswagen Bus, trust us to take care of the problem for you. We are here to assist you with all your car concerns, both online and in the shop. So, please, use the information on the left to contact us and we’ll be glad to schedule your next visit to H&M Motorworks.